Gov. Pat Quinn's rebalancing initiative is enabling hundreds of people with disabilities to move out of large institutions and move into their own homes in the community. IDHS visited one of those homes in a quiet, tree-lined neighborhood and found three men, all former state-operated developmental center residents, thriving and living a new life of choices and dignity. They make their own meals, do their own laundry, go out for walks or play basketball at a local park. One resident works part-time earning a paycheck he uses for shopping with his girlfriend or going to concerts. These photos offer a look at their lives in their new setting. 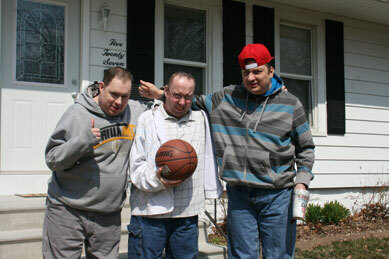 Former Jacksonville Developmental Center residents Ron, Michael and Dennie in front of their house. 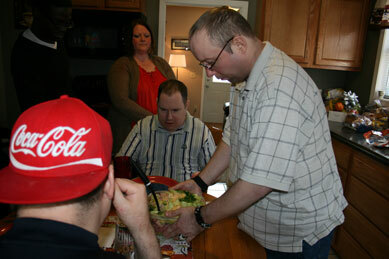 Michael serves salad he made to his roommates, Ron and Dennie while house manager Karen looks on. 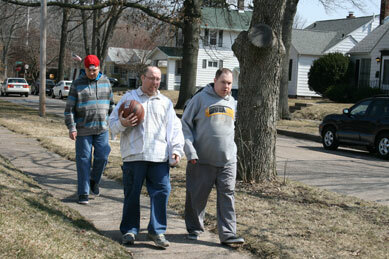 Dennie, Michael and Ron head for the park just two blocks from their home. 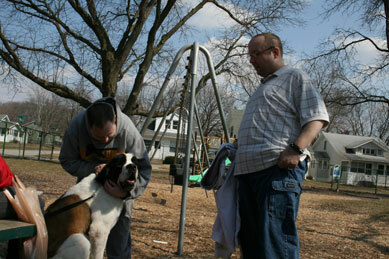 Ron and Michael greet a friendly St. Bernard at the park near their home.